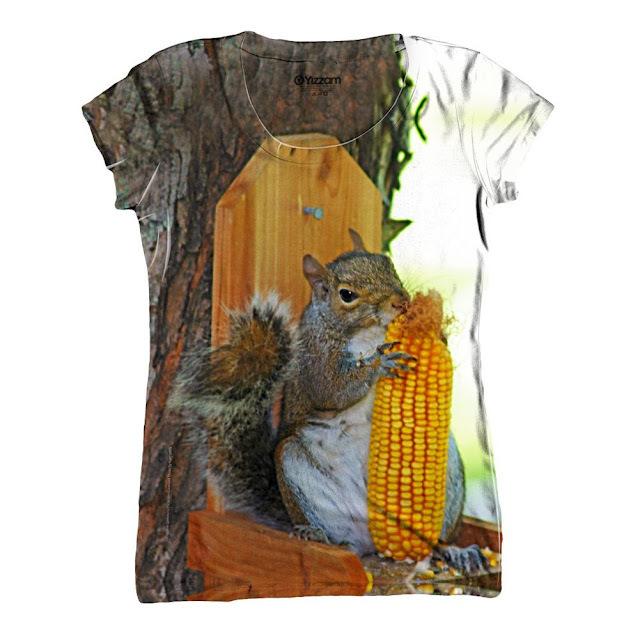 Only the words "I love squirrels" speak that message more strongly than this high resolution image of a squirrel eating a cob of corn on an edge-to-edge printed tee shirt. Funny, love-able, ironic, or a cruel joke - depending on your mindset - this is a great squirrel shirt for men, women and kids. All-Over Print Corn Squirrel Shirt for Men, Women & Kids available from Yizzam as long sleeve, tanks, tees, chiffon, and even as leggings, often in sizes from XS to 4X. Many of us have a friend or relative to who loves to feed birds, and who always seems to be trying to fight off the squirrels from their beloved bird feeders. A shirt like this would certainly be a funny gift for a bird lover. It would also be a pretty great gift for anyone who actively feeds squirrels (check out our gift shop for squirrel feeders!). Or for anyone who has a pet squirrel. I think, though, that the best place to wear this shirt would be under a blazer in a professional setting. Every now and then, someone in the meeting would get a glimpse of this squirrel. It would be great! The printing method used for these all over print tees can leave small white, unprinted on areas in the wrinkles of the shirts. You can clearly see this above, and the links show more examples in case this is a concern for you. On the positive side, each shirt will be unique.